Rose Memorial Library needs your help. Support the library with your tax-deductible donation. Our library enhances the quality of life in Stony Point by providing essential services to everyone, regardless of age or economic circumstance. Your tax-deductible donation will make a positive difference in what we can offer. Print the Annual Appeal donation card to mail in your contribution. Donations may be mailed to Rose Memorial Library, 79 East Main St., Stony Point, NY 10980. Donate online through our PayPal account. Donate directly to Rose Memorial Library Association through your PayPal account using the button below. Once you are logged into your PayPal account, select “Send money to friends and family”. The library’s PayPal account is listed under stp@rcls.org. Thank you for your donation! Due to storage limitations we cannot accept book donations at this time. Shop at AmazonSmile and Amazon donates 0.5% of the purchase price of eligible AmazonSmile purchases to the Rose Memorial Library Association. The purchase price for each item is the sale price, excluding shipping, handling, and gift-wrapping fees, taxes, and service charges, and less any rebates, returns, and bad debt. Certain items are not eligible for and will not result in donations. How does it work? When first visiting AmazonSmile, you will be prompted to select a charitable organization from almost one million eligible organizations. 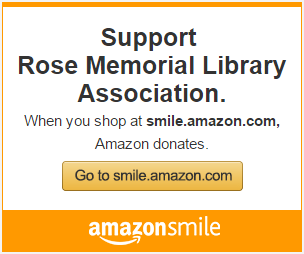 In order to browse or shop at AmazonSmile and support the Rose Memorial Library Association, you must first select Rose Memorial Library Association as your charitable organization. How do I know if the item is eligible for AmazonSmile? Below the price of the item there will be a statement saying Eligible for AmazonSmile donation. Typically, digital items are not eligible for a donation. Conduct your Internet searches with Goodsearch and the Library will receive a penny for every search. Goodsearch is powered by the Yahoo Search Engine. How does it work? Visit www.goodsearch.com and select the Rose Memorial Library Association as your cause. Create a user profile that will allow you to keep track of your individual amount raised. Use the search box on the Goodsearch homepage or download a Good To-Go add-on to search the Internet just like you normally would, with the added bonus that you are earning a donation for virtually every search. Shop through Goodshop and a portion of the sales will be donated to the library. Goodshop is an online shopping mall that donates a percent of your purchase price to the Rose Memorial Library Association when you shop at one of 3,000+ partner stores including top retailers like Petco (up to 4% donation), Expedia (up to 5% donation), Best Buy (up to 3% donation) and Staples (2.5% donation). You can also find 25,000+ active discounts and money-saving coupons so you can save money and give back at the same time! How does it work? When you sign up to use Goodshop and click on the shop button or on a coupon or deal, Goodshop notifies their partner stores that you were referred to their site. Goodshop is given a referral fee when you make a purchase and the referral fee is split 50/50 with Goodshop and the Rose Memorial Library Association. Shop through iGive and a portion of each purchase is donated to the Library. Shopping via iGive is essentially a store rebate program where iGive members have the opportunity to donate their rebate to the Rose Memorial Library Association. iGive receives compensation beyond the posted donation amounts, and many stores pay to advertise on the site. When iGive members shop via the special links, an “iGive Cookie” is assigned to your browser. This tells the store, “Here is an iGive Member” using a meaningless member ID number. The store reports back with this number and the amounts for the donation to the Rose Memorial Library Association. Neither iGive nor Rose Memorial Library Association ever has access to any payment information. AmazonSmile and iGive work great together! iGive plus AmazonSmile mean higher donations on your Amazon purchases (Amazon is currently donating .5% plus the Rose Memorial Library Association earns .8% via iGive for a total of 1.3%). When you use iGive to shop at Amazon, you are automatically directed to smile.Amazon.com. That gives Amazon a chance to help the Rose Memorial Library Association, in addition to the help they make possible via iGive.com.